Last Thursday I had one of those days. You know, the kind where everything that possibly can seems to go wrong. Last time this happened, I was late for work, spilled a juice that I had just spent 10 minutes making all over the floor and when I bent down to wipe it up, the button popped off my dress. My camera slipped out of my gym locker on Thursday morning and smashed on the floor. Attempting to hold onto my flimsy towel, I clamoured over various trainers and gym bags to collect the pieces from opposite sides of the room while toned ladies with towels on their heads stared. Luckily I was going past the Camera Exhange on my way to a meeting and picked up a new lens. But not only did I fix my broken lens later in the day, the new one wasn’t working properly when I went to my dinner that evening. Which brings me onto dinner. I was at Morgan M Barbican with a few fellow bloggers to experience the 6 course winter tasting menu, complete with matching wines. Morgan M, for those of you who don’t know, is famous for his Islington outpost, which is currently closed for refurbishment. His French cooking is revered and his new venue in Clerkenwell has had the Islington regulars flocking. Thursday evening was bitterly cold and I was so happy to be greeted by a warm and friendly French host who took my coat and proceeded to offer me a glass of peach and champagne. We wandered down to our table, which was situated in the Kitchen Gallery with uninterrupted views of the chefs, including Morgan himself at work. I glanced at the menu and was excited about what was to come. The pre starter, cream of ‘Mojette’ beans with lemon confit and pesto arrived at the table. 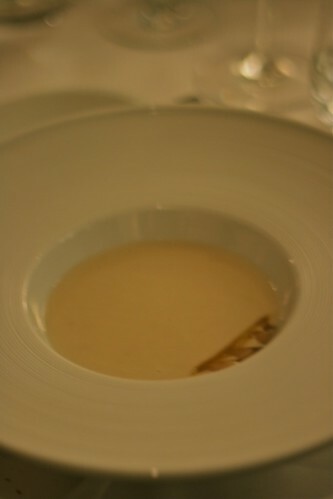 A delicate artwork of carefully constructed foods was drowned as the waiter poured a white bean sauce on top. Upon first spoonful I was in awe, beautiful soft and silky velouté with tender white beans, zesty lemon confit and rich garlicky pesto. As I placed my spoon in my practically clean bowl, the excitement about what was to come was high. 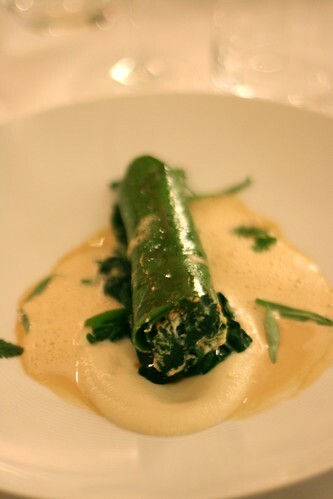 The starter arrived and the rich green colour of the pasta was offset beautifully by the Jerusalem artichoke soubise. It was a thing of beauty. I tucked in and was delighted with the subtle hint of tarragon, the crayfish and lobster delicate and not too rich – it didn’t take me long to finish my dish. The Chateau Clement-Termes 2010 wine that accompanied my starter was rather easy to sip back. A fellow blogger quite rightly pointed out that it tasted of fruit salads. I couldn’t agree more – I closed my eyes and was transported back to summer camp where I would raid the tuck shop for penny sweets and sit with friends on the grassy bank to eat them all before the afternoon session commenced. 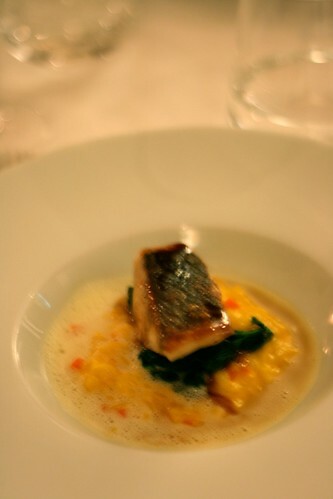 The pre main dishes were next and we were treated to seared fillet of wild sea bass, carrot and ginger risotto in a lemon and saffron broth. The fish skin was crispy and perfectly seasoned, the flesh so tender I could have shouted for joy. The risotto had just the right crunch with a subtle hint of ginger and tang of lemon. By the time the main course arrived, I was getting anxious. Not only was my camera not working properly and I had to manually zoom in dark light (argh! ), I also had to leave to meet my boyfriend at a gig he had planned to take me to a while ago at Heaven. Don’t ask. So by the time the mains arrived, I had a few minutes to enjoy the dish before having to dash off and leave my desserts to my fellow diners. Lucky them. 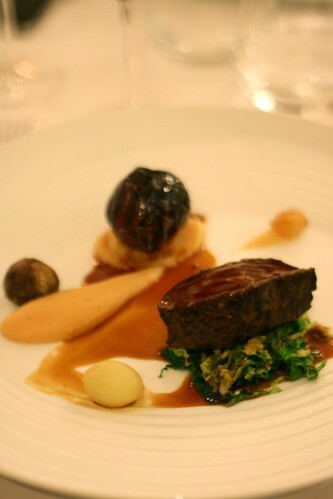 The main in question was pot roasted fillet of Iken Valley venison with farci of hare and quince puree and sauce grand veneur. Why don’t restaurants serve food this beautiful anymore? I almost didn’t want to cut into my plate of food for fear that I would destroy an art work that had been so carefully and meticulously constructed. The venison was pink and tender, the farci of hare extremely rich and gamey. A few around the table thought that perhaps it was a little overpowering and I can see why they thought it but I loved every mouthful. Extremely sad that I wouldn’t be tasting the vanilla rice pudding with orange tuille and passion fruit soufflé with passion fruit sorbet and crème anglaise that I was so looking forward to, I reluctantly fled from the table and ran to the tube. There is no way that I’m letting that pudding get away. I will be back. And next time, I’ll make sure that I don’t’ have to head off to a gay nightclub afterwards.